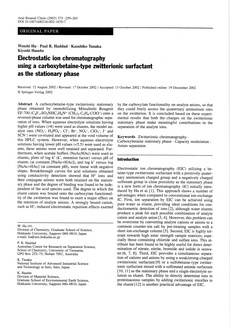 A carboxybetaine-type zwitterionic stationary phase obtained by immobilizing Mitsubishi Reagent EF-700 (C8F17SO2NHC3H6N+ (CH3)2-C2H4-COO-) onto a reversed-phase column was used for chromatographic separation of ions. When aqueous electrolyte solutions having higher pH values (>8) were used as eluents, the model analyte ions (NO2-, H2PO4-, Cl-, Br-, NO3-, ClO3-, I- and SCN-) were co-eluted and appeared at the void volume of this HPLC system. However, when aqueous electrolyte solutions having lower pH values (<5.5) were used as eluents, these anions were well retained and separated. Furthermore, when acetate buffers (NaAc/HAc) were used as eluents, plots of log k' (k', retention factor) versus pH of eluents (at constant [NaAc+HAc]), and log k' versus log [NaAc+HAc] (at constant pH), were linear with negative slopes. Breakthrough curves for acid solutions obtained using conductivity detection showed that H+ ions and their conjugate anions were both retained on the stationary phase and the degree of binding was found to be independent of the acid species used. The degree to which the eluent cation was bound onto the carboxylate functionality of the zwitterion was found to exert a major effect on the retention of analyte anions. A strongly bound cation, such as H+, reduced electrostatic repulsion effects exerted by the carboxylate functionality on analyte anions, so that they could freely access the quaternary ammonium sites on the zwitterion. It is concluded based on these experimental results that both the charges on the zwitterionic stationary phase make meaningful contributions to the separation of the analyte ions.